Flanked by the majestic Alpine peaks of Germany, Switzerland and Austria, the turquoise shoreline and pebbly beaches of Lake Constance are shared between three countries. Exploring by bike is by far the best way to travel here as a 270km cycling path leads from country to country, taking in daisy-strewn meadows, billowing wheat fields, Bavarian vineyards and picturesque marinas. The routes have been specifically designed by our local partner, Donau Touristik, and checked by our managers. This is a region brimming with history and cultural highlights such as the fairytale castle in Meersburg, the flower-decked palace in Konstanz and books dating back over 1,000 years in St Gallen's UNESCO library. Not only does this itinerary offer easy, level cycling on lakeside paths, the flexibility of our route notes is also a huge bonus. We give you fully detailed cycling notes to take you from each hotel to the next; if however, you wish to shorten, or lengthen, your route at any point, simply hop on the local train or boat - taking your bike with you - and tailor your journey to suit. Your accommodation is varied too; you stay in an old coaching inn, a riverside hotel that used to be a C15 customs warehouse, and a luxury lakeside mansion. We've tried to ensure that you are never far from the waterfront, with its pebble beaches, colourful marinas and half-timbered houses. We have included eight evening meals, leaving you free to try some of Konstanz's many restaurants. Look out for local specialities like kretzer (perch) and zander (pike-perch) on the menu, accompanied by fine local wines. Cycle west along Lake Constance's southern shore before crossing the mighty Rhine delta that straddles the border between Austria and Switzerland. It's an area of great natural beauty and a refuge for wildlife - be sure to keep your eyes peeled for kingfishers in the reeds. Your final stretch takes you around the lake to Arbon where you'll find pretty half-timbered houses and a C16 castle. It's easy to spend a morning exploring Arbon's historic old town with its well-preserved buildings. After lunch at one of the many lakeside restaurants, hop on the bus for the 35 minute ride (10km) to historic St Gallen, a bustling market town packed with C18 merchants' houses and open-air cafes. Visit the C8 Benedictine abbey's fabulous UNESCO library, then blow the cobwebs away by freewheeling back down to the lakeside. There's lots of swimming possibilities before an easy waterfront cycle back to the hotel. There's an option to take the train to Guettingen this morning and shorten your route. Otherwise, pedal clockwise around the lake and pass numerous waterfront villages affording lots of panoramic sun terraces for coffee stops and lunch. In the afternoon, you coast effortlessly between sleepy harbours before arriving at the riverside Hotel Rheinfels where you spend the next two nights. It's easy to spend the day in mediaeval Stein am Rhein with its C11 monastery, beautiful frescoed square and lovely chocolate shops! 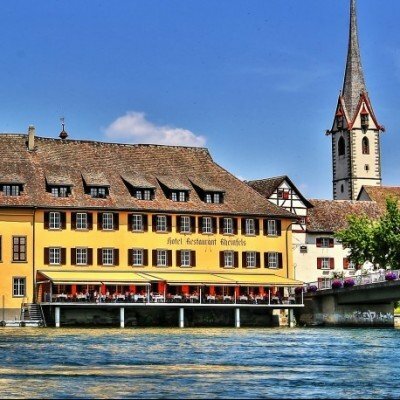 Alternatively, Schaffhausen, a lively German town full of street theatre in the summer, is ideal for a day trip - it's great for shopping and has riverside cycle paths to Schloss Laufen, a tiny castle perched precariously above the tumbling Rheinfall waterfall, the biggest in Europe! Freewheeling east this morning, you'll soon cross the border to enter Germany - look out for cormorant and red-crested pochard in the Hornstaad Nature Reserve. Cycling along the Gnadensee you'll soon reach the UNESCO Heritage Site of Klosterinsel Reichenau, the first populated area on Lake Constance and home to an impressive C8 Benedictine abbey. It's then on to Konstanz, the unofficial regional capital. This is a good holiday and Insel Mainau is a must. 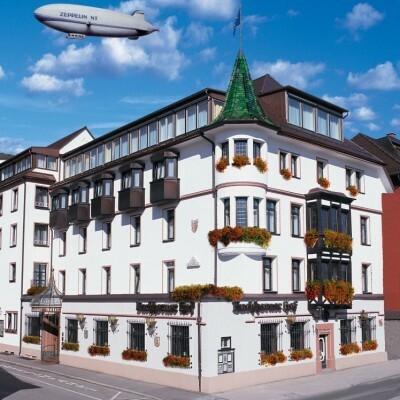 Could not see much purpose of Friedrichshafen if you are not interested in the Zeppelin - arguable an extra day in Konstanz and a longer cycle on cycling day 4 as others recommended the other island nearby, Reichenau, which is a UNESCO world heritage site. My disappointment was how much of the cycle route was away from the lake - there were plenty of non-cycling footpaths nearer the lake and these would have been lovely - my love of suburban housing estates is limited. The Cycle providers were excellent and nothing was too much trouble. Nevertheless, some superb places to visit and interesting things to see - huge orchards laden with apples, storks, herons, red kites, large and small fish in the lake, grape picking to name but a few. We would highly recommend this holiday. The cycling was easy and interesting, the hotels were comfortable and welcoming and the dinners were delicious. Cycling every second day gave us the opportunity to really explore the towns we were in and we appreciated the notes in the regional guides. The only criticism we have was that the route notes were confusing and usually unnecessary as the journey followed a well signposted cycle route around the lake that was very easy to follow. First class.! From the moment we spoke to staff at the London Destinations show in February, through the first enquiry, booking and follow ups, it all went very smoothly and we had a great time including being upgraded in three hotel to Suites!! Fabulous holiday, beautiful scenery and towns, bikes were fab and transfer of luggage excellent. Trip notes were a little confusing in some places and we weren't the only ones that came across this problem, Google maps did come in handy on these occasions. A few more busier roads than I expected but none of these issues prevented me from such a wonderful holiday experience.. Having the extra night in each town enabled us to enjoy and explore the towns that much more than if we had only had 7 nights. All in all a wonderful holiday, would definitely travel with Headwater again and Donau Touristika. Enjoyable easy flat cycling, very scenic. 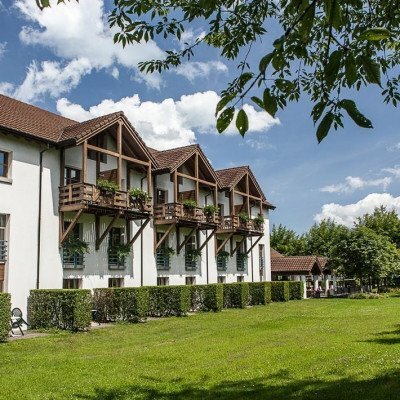 Lovely hotels in Germany and Austria with air conditioning which was needed as temperatures were in the high 20's / low 30's. Headwater's Lake Konstanz cycling holidays offer two options, namely one with rest days and one without. As an occasional cyclist with a desire for travel and experiencing the scenery and culture of the route, we chose the option with rest days. We cycled on only one rest day (around Reichenau island) and often took ferry trips on other rest days. Ferry trips on the Lake offer a fabulous experience. Having seen airships on nearly very day of the trip it was a "must" to go to the Zeppelin museum in Friedreichshaven. Stand-out location - Stein am Rhein. It is absolutely beautiful, but also explore the back streets as well. Headwater provided a vast amount of pre-travel literature. Worth re-reading their location notes before each day's travel. The route notes were extremely detailed. We mostly used them to leave our hotel and find the marked route, and then find the hotel at the end of the day, and occasionally then as back-up. DONAU provided a more compact booklet, which combined maps, culture and route notes, and fits in the DONAU provided handlebar bag. However the route is so well marked (signposts and ground markings) and popular that you rarely need the Headwater route notes while cycling. The 4* hotels were air-conditioned, comfortable and well-located. We thoroughly enjoyed the trip and completed the circuit with a sense of achievement and enjoyment, made all the more real by going up the Pfander cable-car in Bregenz at the end of the trip and looking back at the whole Lake and the places we had been!! All in all - a great trip. As this was our first cycling holiday we were apprehensive especially regarding the train transfers from Zurich airport to our destination but with the excellent information provided with train timetables and platform numbers from Headwater we were able to travel with confidence by train to our first destination of Bregenz at Lake Constance. We enjoyed a fabulous holiday and would highly recommend Headwater to make all travel arrangements. Our holiday run smoothly, hotels were good and the cycling was very enjoyable. Enjoyable holiday in pleasant area using friendly hotels with meals. Impressed by knowledgable and flexible arrangements for bike provision and set up. Luggage transport worked well and trouble free. Cycling mostly on dedicated well maintained cycle paths or quiet roads. Navigation generally straight forward. Distance and terrain matched expectations of grading. Some interesting sites en route and at stayovers. excellently located hotels good value for money and a delightful way to visit 3 countries. The holiday in terms of the arrangements was fine. The bikes were handed over to us with no problems and were of excellent quality. Unfortunately one of my fellow bikers had a puncture. The process of dealing with getting a replacement bike was very easy, a phone call was all that was needed to achieve this. The itinerary was excellent. The amount of travelling time was about right bearing in mind that I am not a regular cyclist. I feel that the itinerary was a bit ambitious for the time we were there as we did not have time to explore some of the places we passed through. The other main thing is that the panniers on the bikes were not of the best quality, they were old and after we started the trip I found a small tear in mine. Perhaps you could look at more substantial panniers rather than the material ones we had. All in all a very good experience. The cycle around Lake Constance was an opportunity to experience different weather situations from the comfort of your bike, to see lovely villages, local areas and explore to your hearts content. A very enjoyable experience, beautiful scenery and amazing food. Lake Constance cycling is the ideal holiday -- exercise (though not too much), sunshine & warmth, nice scenery, variety (three countries), and excellent accommodation, food & drink. Good balance of cycling and rest times creating a relaxing holiday. Fabulous scenery, hotels, food. Cycling easy on days that had to cycle - slightly more challenging when on 'rest days' Up to St Gallen and the Rhine Falls but still easy to complete. Thoroughly enjoyed the whole experience. Rheine falls very busy. Should offer stop en-route for rail and more options for long journeys (over 300 miles). Make sure camera charged up every night. Allow time to explore en route on bike. All locals very friendly in every country and willing to talk. All to easy to eat and drink too much. Hotel staff less likely want to speak English. Have been on a few of your holidays and they have always been very very good. We were initially nervous about a holiday which was managed locally by an agency other than Headwater. Our previous experience had not been great. However we need not have worried. Donau Touristik were hugely well organised and the bikes were excellent. The cycling was just about the flattest we had ever experienced and, partly because of the excellent weather, partly because of the excellent food and accommodation, this was as enjoyable a holiday as we have ever had. A couple of small blemishes. At Bregenz on the first night we were served only a three course meal instead of the advertised four. (We only realised subsequently about this when we returned on the final night). 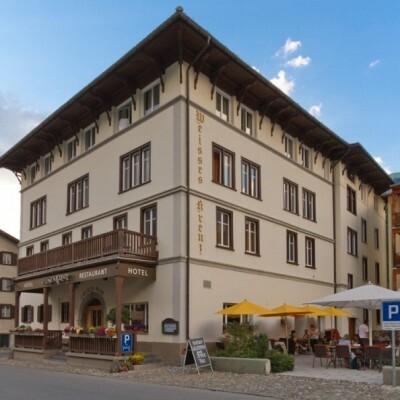 Hotel Buchornerhof was not in the same league as the other accommodation. We were served the wrong food on one evening and the air/conditioning leaked. The staff's hearts did not seem to be in their work as it was in the other hotels. One warning - wine in the hotel restaurants (especially the Swiss ones) is very expensive indeed. These are small gripes. It was a great holiday and I'd do it all again anytime. This was our first organised cycling holiday and it exceeded our expectations, the quality of hotels were fabulous and we really liked that we had 2 nights in each hotel which gave us time to explore each area. On reflection we would prefer to have had dinner in the hotel halm included as finding somewhere to eat was a real hit or miss and compared to the meals we had in the hotels we didn't find anything better. From our first enquiry with headwater the whole holiday couldn't have gone smoother, Michelle (I think) tailored the holiday to fit our needs perfectly adding in 4 extra days and organising the hotel for two of them. I certainly can't recommend headwater highly enough and have already looking at where to go next. Thank you to the whole team as this has to be one of our best holidays and we have had many! A special thanks to the couple at the bike hire, they were extremely friendly and very helpful. It was a real fun adventure. The excellent support and hotels allowed for maximum enjoyment. A thoroughly restful holiday through stunning countryside. Excellent cycle paths which take you away from the busy roads and where you can set your own pace. The option to shorten journeys using trains or ferries was useful. Our ninth headwater holiday and one we would take again in a few years time. Switzerland is an expensive place to visit but the half board basis of this holiday offsets some of that cost. Our group of eight ranged in age from 48 to 72 and everyone found it a comfortable and enjoyable cycle. Lots to see and do on the rest days which meant that we packed a lot into each day. The fabulous chocolate, kaffee und kuchen could be offset quite easily which was a bonus! We didn't think this holiday was representative of Headwater cycling holidays in general. This was our fourth Headwater holiday, and compared to the others (Italy, Spain and France), it was disappointing. The cycling routes were not as pretty as on other holidays, and there weren't so many nice places to stop for lunch or to admire the scenery. This was partly to do with the different culture, of course, but it also had a lot to do with the cycling routes themselves and the hotels. We didn't feel that the usual Headwater support was there, and this was partly reflected in the route notes. Although they were OK, we thought they could have been more helpful and they were at times inaccurate. The cycling was more difficult than we expected it to be, so we were glad to have the option of cutting some days short by using the ferries or trains. Although there were a lot of cycle paths, they were often alongside (or on) quite busy roads. We enjoyed our visit to the area very much, and apart from the luggage problem, we had no real difficulties. However, we did have one concern that troubled us. On previous headwater holidays, we always felt that we had the reassurance of a Headwater rep to contact in the event of any difficulty, e.g. in the event of an accident, buckled wheel etc.When we asked the Donnau lady what would happen in the event of such a situation arising, (expecting her to say we'd come out to you), we were most disconcerted to hear her say that 'you have a list of Donnau stations around the lake. If you have a problem you must go to them - they will not come to you'. We had not realised the implication of the arrangement Headwater had with Donnau, that resulted in raising our anxiety levels if anything had gone wrong. We would certainly check with Headwater if booking a future holiday that we had a local rep at hand. If there wasn't , we would not book that particular holiday..
One last point. In places, the fine detail in the instructions was inaccurate and misleading. this delayed us on occasions. Easy cycling, lovely scenery, excellent hotels. Cycles well maintained and maps and route notes easy to follow! This is just a wonderful part of the world for cyclists who like to immerse themselves in a beautiful, safe and friendly place. As you'd expect in Austria, Switzerland and Germany, everything works so well to give you a hassle-free holiday. Everyone was so welcoming, locals as well as people providing service and quite happy to use their excellent English in place of my stumbling schoolboy German. The travel arrangements/organisation and detail excellent. Two of the hotels were not nearly as good as the rest . In fact the last hotel was way below standard but the food at that hotel was excellent. The rooms were far too small there was no air conditioning and it resembled the most basic accommodation. The middle two hotels were outstanding as was Bregenz but Seegarten again had no air conditioning is not well positioned. The holiday satisfaction, accommodation and value would all have ranked 'excellent' had it not been for the experience on nights 4 & 5. We did not aloow that to impinge on our overall enjoyment, but it was annoying and frustrating at the time. Interesting and enjoyable. Pleasantly surprised by high standard of hotels and food! Lake Konstanz is a lovely location. The cycling is mostly very easy and having two-day stops provide an opportunity to explore around each town. The first couple of days was through fairly uninteresting landscape. Thereafter it was fine but not outstanding. The headwater format is generally constant, but on this occasion we had no representative. It didn't really matter, but first timers could find this difficult. Overall great holiday. Cycling excellent. Lovely scenery and great condition of cycle paths. Some of hotels were disappointing in certain aspects - no tea/coffee; old, tired bathrooms with no bath; small room however usually made up with friendly service and excellent food. Friedrichschafen is not a very attractive town - Lindhau might be a better option. Hotel Weisses Kreuz the favourite hotel - great sized room, comfortable bed and pillows and great bathroom. Cycling this route was very easy. The paths were almost all off-road, or well separated from the traffic, on good quality cycle paths, even in the towns and cities we visited. Hardly any inclines on the whole route, with only one where we had to get off and push. The bikes were in excellent condition and ideally suited to the task. The hotels were all of a very good standard and well located. Lake Constance is very scenic and has a relaxed holiday feel to it, no matter where you are around its periphery, with countless places to stop and eat/drink/admire the view. Overall, a very enjoyable holiday and one of the best we have done with Headwater. The route notes were clearly wrong in places (I made this point two yearsago!) and gave the impression of being written by someone who had not cycled the whole route. thank fully though there were plenty of plus points!! the team who sorted the bikes and transfer of luggage were exellent, Lydia and Sylvester were superb and a credit to the company. the route notes were ok but we found on the first day that we were having to stop too many times so from day two we found it much easier to just follow the bycycle signs which kept you more or less on the right route and allowed for more enjoyable touring without the stops. We really enjoyed our holiday and would certainly book with you again. It would be more enjoyable though if you could give some thought to the meal situation as we were not the only ones to raise the above point. Absolutely perfect in every way. The office staff at Headwater recommended this holiday to us when we couldn't get the accommodation for our chosen holiday (Austrian Lakes). We are so grateful for her recommendation as it was a wonderful holiday. The bikes were superb and all the routes were incredibly safe and bike friendly with most of the cycling being on dedicated cycle tracks. Bliss! Thoroughly enjoyable adventure for all ages and the over 65s! Excellent organisation and help from travel arrangements tailored to our needs to hotel accommodation. Excellent holiday - we look forward to coming again. Would like to see longer holidays offered - 14 days plus. We felt disappointed as there was no personal service, the Donnau company just gave us bikes without help and tried to palm of bald tyres and broken lights, luckily we insisted they change the bikes to our satisfaction but if this had been a couple who had never taken a Headwater bike holiday I would feel very sorry for them. We were very disappointed that we saw no one representing Headwater no welcome meeting as described in the literature. We enjoyed the holiday but certainly rated it as the least enjoyable out of the previous 3 trips. Cycling good, the free days poor, no suggestions of bike excursions no information found in english. No one to talk to about trips. St Gallons not that special the hand written medieval books in German advised in broshure not that exciting. The food described as 4 courses were very limited with minimal choice and 2 of the hotels were really poor. I have completed your feedback form but you have got one of the hotels listed incorrect. We did not stay at Hotel Rheinfels as they did not have any available rooms. We stayed at Hotel Hoeri am Bodensee and my comments are obviously about that hotel. Apparently every year on that weekend there is a conference in Stein am Rhein which takes over all hotel rooms so this should be noted for future reference. My bike was stolen from outside Hotel Halm. The lock up arrangements for the bikes at that hotel were not adequate and these need to be improved. However the staff who helped me were brilliant and it was all sorted out very quickly. We had a lovely, lovely holiday. The bikes were so good we wanted to run away with them, the food was universally very good and the hotels were pretty good at providing for our vegetarian diets. The breakfast buffets were wonderful - I'm converted to Bircher muesli now. It was easy cycling with excellent route description in a very beautiful part of the world. Who would believe you can have a cycling holiday in Switzerland, Austria, Germany with no hills! Really good fun and quite an adventure. Worked very well for my two children of 9 and 11 who loved the cycling and swimming. The cycling was very enjoyable with excellent cycle paths and easy to follow directions mostly. There were a couple of unclear directions towards end day at Konstanz and Steim um Rhein. Weather was very good and amenities for tennis and swimming great. No major problems with the bikes although back up was not that good according to other members of the party who had punctures etc. Fabulously organised and a really different experience for us. We loved the independence, the superb scenery and the wonderful sense of adventure. Freewheeling down hills for 10 days was something neither of us had done since our teens. A brilliant holiday! Thank you so much! 2) The bicycling stages were rather long. But, as the brochure said, it was easy to reduce distances by putting the bicycles on trains or steamers. Also almost all the cycle paths were well surfaced, marked, etc. 4) My wife had some difficulties with the Donau Touristik bicycles. These went, and stopped, well. BUT their - to us, unfamiliar - concentration of weight around the back wheel meant that, when suddenly checked, they could easily tip over to the left, & she fell off twice. 5) a) The hotels were all of a high standard. But we personally felt the 4-course evening meals rather too much & too rich, & enjoyed the ability to secure our own simpler ones in Konstanz. (More generally, I think we preferred the 'agro-turismo' arrangements of our earlier Veneto Headwater cycling holiday.) The breakfasts were mostly very good. Thought the Lake Constance area was beautiful. The dedicated cycling paths made the cycling a pleasure and the mix of cycling and rest days really suited us. Very enjoyable holiday, very good cycle routes, lovely scenery and some very pretty villages. Plenty of opportunities to use the train or boats to shorten cycle distances if necessary or preferred. Every two days from 23rd Apr 2019 to 20th Oct 2019, for 10 nights. All dates are subject to availability, please contact us to check. There is no free parking in Bregenz. We can pre-book car parking for you for approx. £81 or you should budget to pay locally approx. 120 euros for 11 days. Self-drive prices: Above prices include Eurotunnel. (Please note vehicles fitted with either LPG or CNG fuel are not accepted for travel on Eurotunnel). Due to the tailor-made nature of our holidays, we need a little more information in order for us to check availability for Lake Constance Cycling. Simply complete the form below and a member of our sales team will contact you (when it's most convenient for you) to provide availability information, travel options and an accurate price. Of course there's no obligation, but if you do wish to proceed with a booking they will be on-hand to assist you throughout the process.